Sport meets art when birds are the hunters. On a cool, cloudy morning in Central Texas, I walk along a brushy, briar-filled creek lined by pecan trees. I slip on my briar chaps and call for TJ, my hawking buddy, an overgrown Jack Russell terrier. Riding hooded on my leather-gloved fist is my bird of choice for this excursion — a female red-tailed hawk, the workhorse of American falconry. My hawking vest holds tidbits of meat, game shears, a slingshot and a receiver to track the hawk if she gets lost. I attach a small transmitter to the hawk and remove the hood, and the hunt begins. The quarry is probably pound-for-pound the toughest I have ever encountered: the fox squirrel. The dog runs ahead, trying to peg down a scent, looking back at the bird periodically. In this type of falconry, I rely on the redtail’s sight. She is the one that will spot the quarry. I walk along the creek bottom, following her lead, rattling long vines in hopes of stirring something up. Bells on the hawk’s feet let me know when she moves, and her body language lets me know that she has spotted her prey. She moves to a higher branch and turns around. I can’t see a squirrel, but she is telling me it’s there. In her own way, she points out its location. She moves to a different tree, a higher branch, and again turns to face it. I follow her eye direction and spot the bushy tail. Squirrels won’t panic, even while pursued. They never lose their cool and will fight to the end. This squirrel is in its home territory, where it knows every hole and every branch. What happens next will test these animals’ wits like a professional chess match. Who is going to make the wrong move? The redtail I fly is a well-seasoned bird that has taken hundreds of squirrels. She makes a move at the squirrel, and the squirrel decides to run farther up the tree, leaving the bird behind. Down below, TJ waits, hoping the squirrel decides to bail and hits the ground. But this squirrel isn’t going to bail — not yet. It swiftly jumps through several trees, but the redtail pursues, and calculatedly swoops at the squirrel again, this time catching it in mid-leap. The hawk helicopters down with her prey. I move in, and the hunt is over. The dog sniffs at the squirrel from far away, perhaps recalling a painful lesson from some time ago. 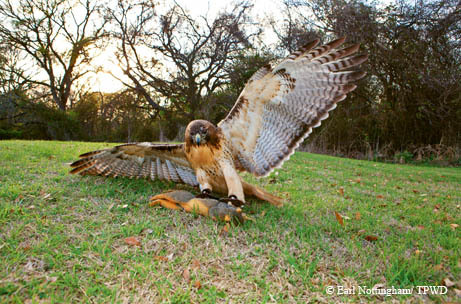 I offer the redtail an exchange (a reward for her work), and she steps off the kill. Soon she’s back in the trees, and we’re working our way back to the truck. Time and again, she spots her prey, and the chase begins anew. The death dance takes them twirling through the trees and winding through a maze of branches. Even when the hawk misses, the chase is phenomenal to observe. Falconry is the art of hunting wild prey with trained raptors. The sport is believed to have originated in Asia, spreading through trade routes into the Middle East and Europe. In North America, falconry was introduced by the British; the sport began to flourish throughout the United States after World War II. Today there are more than 5,000 falconers in the United States; in Texas, there are more than 200 licensed practicing falconers. 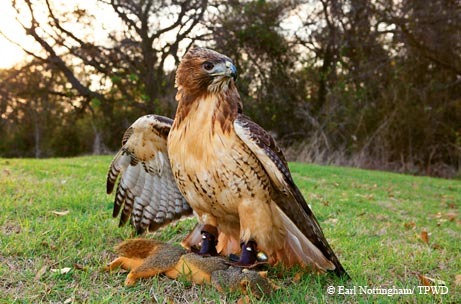 Texans are blessed with some of the best falconry in the country. Varied terrain and a plentiful supply of a variety of raptors result in a cornucopia of potential experiences for the Texas falconer. Even though we fly trained hawks, we are still bird watchers at heart. Falconers just happen to have a ringside seat at a bird-watching event that not many people get to observe — raptors on the hunt. Birds used for falconry include falcons, hawks and eagles, and the birds are selected for use against a particular type of quarry based on their skills and personalities. Different species of raptors offer a wide array of flight styles and chase behaviors. Falcons have long, sharp wings, resembling those of a fighter jet. The peregrine falcon is the fastest animal on the planet and has been clocked stooping at speeds of more than 200 miles per hour. Accipiters are another type of raptor, a group that includes the goshawk, the sharp-shinned hawk and the Cooper’s hawk. They are the cheetahs of the bird world, with lightning-fast flights. Accipiters have short wings and long tails, built for quick maneuvers through forested areas. Buteos include red-tailed hawks, red-shouldered hawks and ferruginous hawks. These birds have robust bodies with broad wings designed for soaring. The red-tailed hawk is the most widespread hawk in North America. It lives in all terrains — a hardy species, an opportunist. 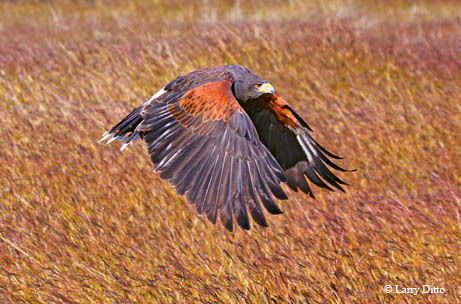 Harris’s hawks share some characteristics with Buteos but have leaner bodies. Eagles are the most majestic of all the falconry birds. The golden eagle boasts broad wings that span more than 6 feet. Eagles share the traits of keen eyesight and deadly talons, the tools of their trade, with all raptors. The falconer drives along country roads, binoculars in hand, carefully looking at stock ponds, searching for ducks. Once he spots them, he pulls his truck out of sight and quietly shuts the door. The tactic here is silence — ducks will fly off at any strange noise. He unloads his dog, Kate, and his bird of choice for this hunt, a first-year tundra peregrine he has trapped and trained. When the falcon is on his fist, he removes the hood, and off she goes. He walks slowly toward the tank, giving the falcon time to fly high, catching a thermal to help it climb to the heavens. When she flies over the ducks, they recognize her well-known silhouette and stay in the water, hoping the predator is just passing by. The falconer watches the falcon closely; by now, she’s just a speck in the sky. When she reaches her position, he waves his hand, signaling the impending flush. Time stands still as falcon and dog wait, Kate attentively listening for the next command. Kate joyfully sprints over the hill, barking and jumping in the water. As soon as the ducks fly, you can hear an increasingly loud low sound, like a jet engine fast approaching. It’s the falcon, stooping like a missile, aiming at the target she has selected from a thousand feet in the sky. It’s only a matter of seconds before she hits it, with talons piercing at speeds of more than a hundred miles an hour. The duck hits the ground and the falcon quickly follows with a beautiful wingover. If the duck is not dead from the impact, the falcon will mercifully dispatch it with a lethal bite to the neck. The hunt is over for today. We are in the Texas Panhandle, rolling through beautiful plains that stretch as far as the eye can see. To some, the land might look empty except for a few cows grazing near a windmill. But to falconers, this is an exciting arena, where predator and prey will soon play out a life-and-death drama. Three falconers retrieve their hawks from their specially built transport boxes. Each sits on a separate “T” perch that is carried like a flagpole, giving the hawks a high view while in the field. The selected raptors for this day are Harris’s hawks, named by John James Audubon in honor of his naturalist friend Edward Harris. The Harris’s hawk is a popular bird in falconry because of its well-mannered demeanor and its instinctive behavior to hunt in groups. Known as the “wolves of the air,” Harris’s hawks are found in South and West Texas, New Mexico, Arizona, Mexico and South America. The falconers venture out to the prairie, attentive hawks held high. Soon, the yell of “Ho! Ho! Ho!” comes from one falconer, and all three birds tear off in hard pursuit. The first hawk closes the distance and stoops at the fast-running jackrabbit. She just misses as the jack quickly makes a sharp left turn and tries to head upwind. The second hawk slams it, but somehow the jack is still running, vigorously trying to kick the hawk off its tail as it flees. Quickly, the third bird comes in and grabs the head of the rabbit. The 5-pound jackrabbit is caught, and in no time, all three birds are on the hare. The falconers come in and assist the hawks. If the hare is alive, it is quickly dispatched. The hawks are given a trade for their success, and the falconers place the jack in the game bag. The hunt continues. A couple of miles away from the jackrabbit field, a different type of hawking is needed because of a change in cover. Cholla cactus dots the terrain, and the quarry we seek is feathered and explosive. 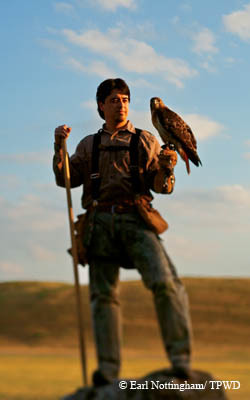 With a German shorthair pointer leading the way, the falconer walks along holding a goshawk. The flight of this bird is characterized by an incredible burst of speed and unbelievable maneuverability. The dog is on point, frozen. The falconer slowly approaches where the dog is directing. “Whoa, whoa,” he softly commands, and the dog obeys. Suddenly a covey flushes! Quail is the quarry, and the goshawk explodes. With amazing speed, the hawk closes in on the fleeing covey and nabs one. The dog reaches the hawk before the falconer does, but ignores the hawk as, very nearby, he is again on point. The falconer takes the quail by offering the bird a piece of precut quail, and the goshawk is back on the fist, not quite settled down from the chase, when a lone quail bursts out. The goshawk tails it, and No. 2 is in the bag. The falconer heads back toward his truck but keeps the goshawk on the fist, ready in case anything is kicked up on the way. Sure enough, a cottontail rabbit is flushed, making a straight dash to his hole. The goshawk pumps its wings, gains speed and then, in what feels like two seconds, it’s over. The rabbit has made it to the hole, and the goshawk is halfway down the entrance. To a falconer like me, this is what’s exciting — the chase, the thrill, the unexpected surprises. Like the thrill of discovering that the goshawk has not lost its prey, but has captured the rabbit in the hole’s entrance. It’s more than just a thrill to falconers, however. Like with any type of hunting, we make time to enjoy the outdoors, learning and observing along the way what nature can teach us so we can apply it to our everyday lives.